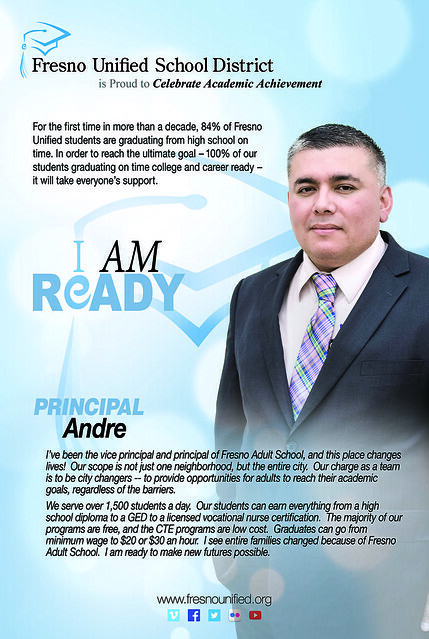 The "I Am Ready" (social media hashtag: #FresnoUnifiedIAmReady) citywide campaign encourages the entire community to work to elevate the district towards preparing 100% of students to graduate college and career ready. This initiative motivates every citizen in Fresno to be a part of the academic success of more than 74,000 students. Opportunities for college and career choices are expanding for students in Fresno Unified. Great things are happening for students in Fresno Unified but we will only be able to reach a 100% graduation rate with the support of the entire community. View the public service announcements and read the testimonies from students, teachers, parents, community members and others about what they're doing to ensure that 100% of our students graduate college and career ready. Are YOU Ready to Support Our Students? There are a number of ways that everyone in our great city can support the more than 74,000 students we serve every day. There is no deed too small, no donation too insignificant to help our students reach their goals. Whether you donate your time or your money, it will be put to tremendous use and it will be greatly appreciated.